Komar Martinez-Paiz ’19 hails from the Berkshire School and is Wesleyan’s top midfield playmaker. 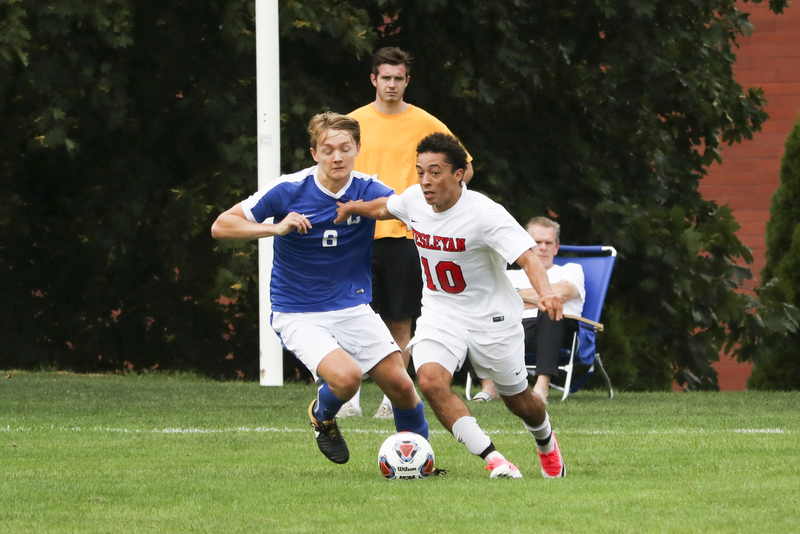 His talents earned him second team All-NESCAC last year, which came as no surprise to his teammates or those who watch Cardinal soccer games. This year, he looks to recreate the magic from his freshman year in 2015, when he helped lead the team to a NESCAC final. The Argus: What is it like stepping into a big leadership role like that one you’re in? Do you think about your impact on the team? Komar Martinez-Paiz: It’s a responsibility that cannot be taken lightly. It takes patience, discipline, and awareness to be a leader, all of which I am trying to improve on. Coach had already named captains prior to the season, and I knew that I had a lot to work on to be an effective leader this season. Throughout the summer I played on a team with about 30 players and served as captain on that squad as well, and it was good practice for me. That opportunity was essential for me, as it exposed me to the pressures and hardships of being a leader. It has been so important for me to tackle those hardships head on and to acknowledge the way that my approach impacts the team. I have found communication to be one of the key aspects in being a leader. A: What is special about your story? Give us some background on where you came from and how you got here. KMP: I have been very fortunate to be in the position I am in. Many people have helped me along the way. I started playing for local teams back home in West Warwick, R.I. and continued to work my way through the ranks, later playing for a club team called Bayside FC. I was recruited in my junior year at public school to play for a prep school called Berkshire. This school had an incredible team with players from all around the world, and I took the opportunity to further pursue both athletics and academics. During my senior year I was contacted by Wesleyan, and after a visit on campus and meeting the team I was sold. That is the simplified version, but it took hours and hours of practice, tears, pain, and obstacles I couldn’t really prepare for. I had great mentors in my friends, family, and coaches who I have learned from and who have helped me be who I am today. A: What does soccer mean to you? Describe your feelings towards the game. KMP: Soccer is honestly a very central part of my life. I have played it ever since I can remember. I have spent countless hours grinding and working on my craft both to be a better player but also because it truly makes me happy. After a long day of classes or studying or working, there’s nothing that makes me happier than getting touches on the ball. One major part that is sometimes overlooked is the lifelong relationships you create through sports. All of the people I have met through Wesleyan’s soccer program have had a huge influence on my experience here at Wesleyan and on me as a person. We have bonded through wins and losses, joy and sadness, and been there for each other in times of need. It is something I try to think about every day: to do my best and not take it for granted. The relationships and the love and joy soccer brings have been and will continue to be a very important part of my life. A: What former Wes soccer players do you look up to or have you learned from? What did you learn from them? KMP: Two that stick out to me right away are Charlie Gruner [’17] and Hans Erickson [’16]. Hans graduated my freshman year, and Gruner graduated my sophomore year. Aside from their abilities on the field the main things I learned and observed were their leadership qualities. While Gruner worked harder on the field than anyone I have seen in this program, Hans was one of the best communicators I have met. They were both leaders on and off of the field and knew how to speak to their teammates both carefully and firmly. They had a way of helping us understand how to align our goals with the goals of the team and how when we did that it would help the team be successful. In those times when we had poor performances or we lost, they knew how to stay positive and bring the team together. A: How does the off-season factor into how your team performs? Is there a visible correlation? KMP: The off-season is a major factor in the team’s performance. We have placed an emphasis on understanding the game plan and the way we will play. The off season provides us with an opportunity to work on our play and to also spend a lot of time together doing it. Our friendships grow, and we understand each other much more, especially that year’s freshman class. We believe that through knowing each other personally and maximizing the amount of time we spend together we will fight harder for each other and grind for each other. I have heard many players this year talking about how the atmosphere of the team is much different than other years and that we are much closer than we have been in the past. Although this closeness has not necessarily showed up in terms of results, we still believe firmly that our closeness and willingness to compete for each other will help us get to where we need to be as we near the end of the regular season. A: What will you miss most about playing for Wes? KMP: I think that what I will miss the most about playing for Wes is the family that I have become a part of. Growing as a player and a person with others is a very intimate experience. It is something that I wouldn’t give up for anything. The friendships I have made and the memories we share I will carry with me for the rest of my life. A: What are your plans for the future? What lies ahead for Komar? KMP: Following my graduation my dream and goal is to continue playing soccer. My plan is to go on trials and potentially go abroad to try and make that dream come true. I will use many things I learned from both players and the coaching staff to help me on that path. Many people have faith in me and believe in me, and I am so grateful to have such a positive support system here at Wes. I will truly and dearly miss the program and all of the people involved who have made it so special.